I spent many years dipping bits of goat’s cheese into pesto i’d made with parmesan. I don’t know why it took me so long to make a simple substitution! Hazelnuts are a great sub for pine nuts too, being cheaper, and with more depth of flavour and texture. You might even be able to use wild-harvested, or at least UK sourced nuts. Large bunch of wild garlic – leaves, stems, buds, flowers, seed pods all work fine here, though the earlier in the season you can harvest, the more vibrant the flavour. The more you use, the punchier your pesto will be. Don’t be shy to mix in other wild alliums like few-flowered leek, or wild brassicas like hedge garlic, hairy bittercress or sea radish. Washed. 200g hard goat’s cheese. I use this excellent one made in Galloway, or you could use Bonnet, another of our very fine hard goat’s cheeses. Blitz the hazelnuts in a food processor. Grate the cheese and roughly chop the plants, then add with all the rest of the ingredients except the rapeseed oil. Blitz, adding a trickle of rapeseed oil until you reach a consistency you like. Serve as a dip, mix through pasta, add to pizza, sandwiches etc. 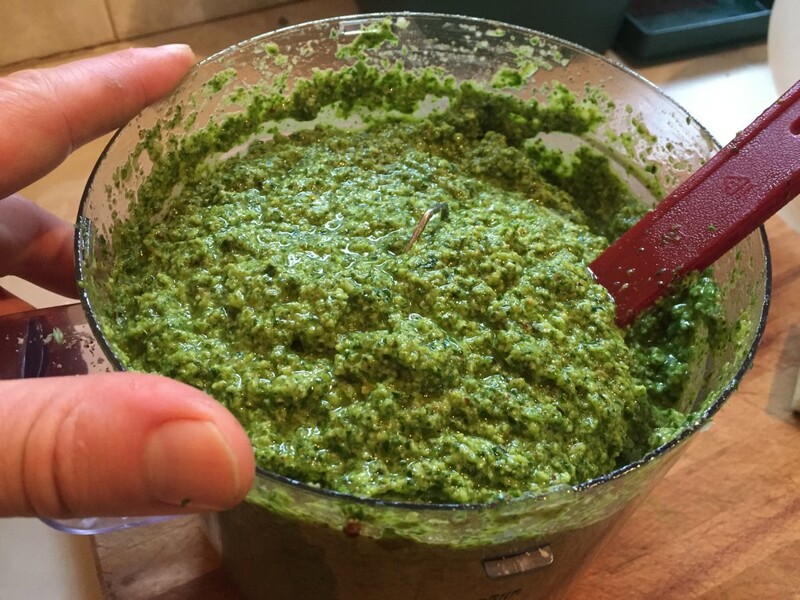 Remember that the oils that make wild garlic so pungent are highly volatile and the more you heat your pesto, the less flavour it will have. Store finished product in a fridge with a sealed top. If making a big batch (which is how I usually roll with this sort of thing), freeze in small tubs. 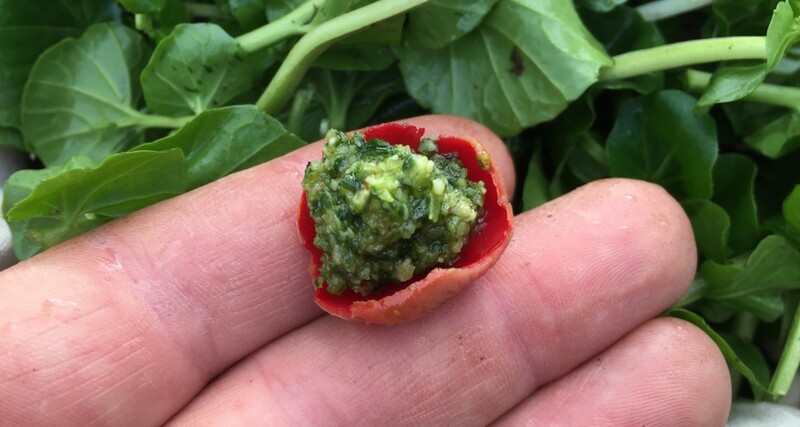 Amuse bush…Scarlet elf cup stuffed with wild garlic pesto. Made this this afternoon, Mark. Thanks for the fab recipe! 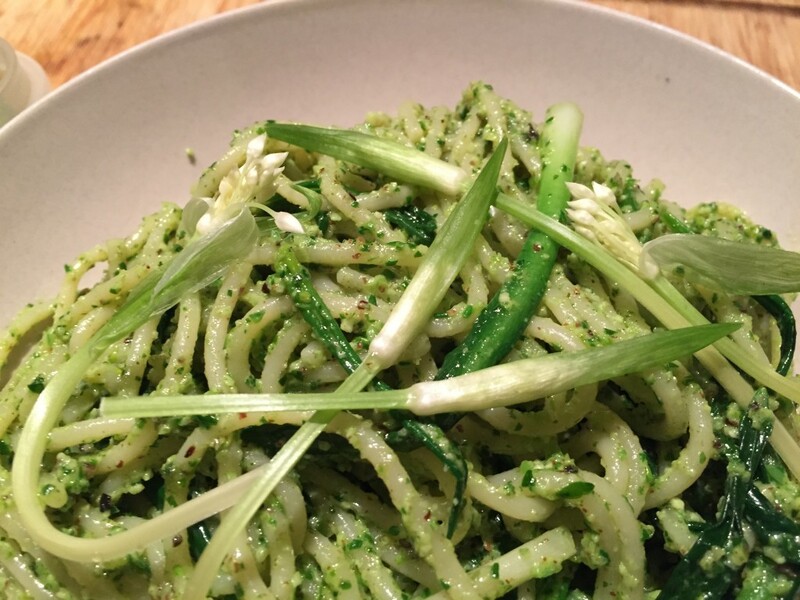 Thank you for this wonderful recipe – it’s so fresh and vital! I threw in a few yummy bramble buds too! off to pick some today, can you also eat the flower buds? I’m just not 100% sure.